Kobo has its work cut out for it. The digital bookshop company reentered the US market this year, teaming up with Walmart to sell Kobo e-readers, the millions of books in its e-book library, and a new audiobook subscription service. The Rakuten-owned company faces stiff competition not just from Amazon, the reigning e-reader and e-book king, but also the looming reality that e-reader technology hasn’t changed drastically enough to propel consistent sales growth in recent years. But Kobo is convinced that it can thrive in the US by offering competitive e-readers that feature no ads and by using Walmart’s physical and online reach to introduce e-books and audiobooks to new customers. To do this successfully, Kobo needs a few things: solid e-readers at various price points, a vast e-book and audiobook library with deals and incentives that create loyal customers, and, hopefully, unique features that Amazon doesn’t have. We tested out the $ 279 Kobo Forma, one of the company’s newest e-readers and its competitor for Amazon’s $ 249 Kindle Oasis. It’s decked out with all of Kobo’s advanced e-reader features—an 8-inch 300ppi E Ink display, a waterproof design, and zero advertisements, to name a few—and as a whole, the Forma dutifully showcases what Kobo can add to the US e-book market. If you’ve seen the Kindle Oasis, you know what the Kobo Forma looks like. 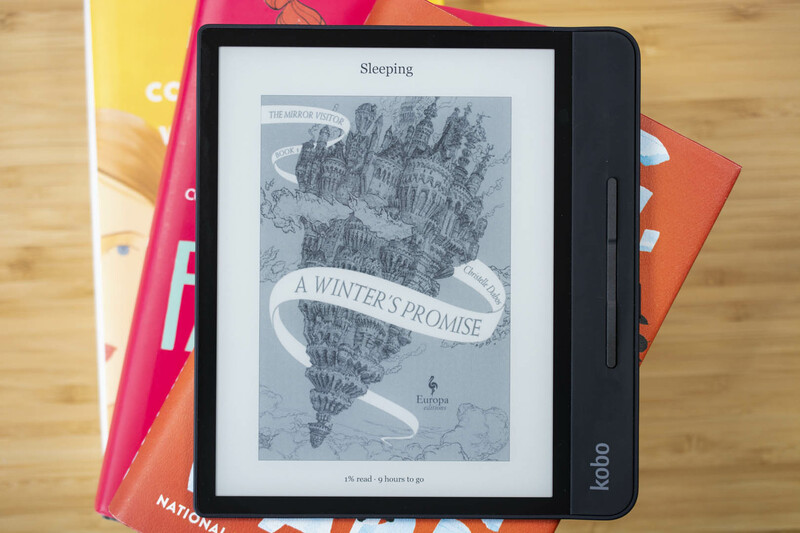 Kobo adopted what has come to be the standard “premium e-reader” design for the Forma, featuring a large E Ink display with a wide side chin adorned with page-turn buttons. The Forma sports an 8-inch 300ppi screen, making it slightly larger than the 7-inch 300ppi screen on the Oasis. Coming from a Kindle Paperwhite, the Forma’s size required an adjustment for me. It felt noticeably larger in my hand, and holding it by its side chin with just my right hand felt alien at first. I typically hold my Paperwhite with both hands, gripping it by its chunky black bezels. But once I got used to it, the Forma’s design made it comfortable and more convenient to hold since it freed up my left hand. The page-turn buttons complement the design, allowing you to flip pages without touching the E Ink display. Much like the Oasis, the Forma adjusts to the orientation in which you hold it, so both right- and left-handed users can grip the side chin comfortably. You can even hold it so the chin is at the bottom and the contents shift to landscape mode. But the best feature about this is that the Forma’s page-turn buttons automatically adjust to fit your orientation. That means the proper button always turns the page forward, while the other always goes back a page. The touchscreen is the Forma’s main attraction, and Kobo didn’t add any other design flare to the device. Soft-touch black plastic makes up its back, and only the power button and the microUSB port adorn the widest edge on the side chin. While I wish Kobo put a USB-C port on the Forma, microUSB seems to be the charging port of choice for most e-readers (if only thanks to the “If it ain’t broken, don’t fix it” mantra). Like Kindles, the Forma boasts a weeks-long battery life—my review unit fell to about 75 percent battery life after a week of on-and-off use. Despite the inclusion of the microUSB port, the Forma is IPX8 water-resistant just like the Oasis. Amazon just brought that feature to its $ 129 Paperwhite, but Kobo’s similar $ 129 Clara HD doesn’t have a waterproof design. However, those looking for a more affordable, waterproof Kobo device have the $ 179 Aura H2O to consider. A bevy of front lights (11 cold LEDs and 10 warm LEDs) illuminate the touchscreen in dark environments, and the Forma also has a Natural Light feature that automatically adjusts the light’s temperature based on the time of day. By default, the front light is white with a blue hue, but adjusting Natural Light settings brings in more orange light that’s easier on the eyes. If the automatic setting is turned on, the Forma will adjust the amount of orange light present without any prompting from you. The customizable bedtime setting also tells the Forma when to bump up the orange light in the evening to prevent extra blue light from having a deleterious effect on your eyes and mind before sleep. The Forma’s Natural Light setting is much like Night Shift on iOS devices and Night Mode on Android devices, and it works with the E Ink technology of the touchscreen to make the reading experience quite comfortable at all times of the day. Kindle devices cannot adjust for orange light, but the Oasis has an ambient light sensor, so it can adjust brightness automatically depending on the available light in the room. New Kindle Oasis models also have Audible integration, but the Forma doesn’t have the ability to play audiobooks. To support those larger files, the Oasis comes in a 32GB storage model. The Forma doesn’t need that much space, so it’s only available in an 8GB model (which should be perfectly fine even for those with big e-book libraries). While it’s a perk to be able to keep your entire digital book library on one device, I didn’t find any other advantages to listening to audiobooks on a Paperwhite that weren’t already available in Audible’s mobile app. Also, Kindle restricts audiobook downloads to Amazon-owned titles, so you can’t outfit the Oasis or the Paperwhite with audiobooks borrowed from your local library.